For us at the Wisconsin Union, the past year has been one of far-reaching impact and countless memories. 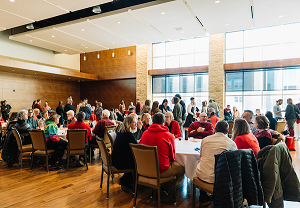 We are grateful to each and every one of you who attended an event, visited our buildings, relaxed with us, and supported us in our mission to make lifetime connections on campus. Along the way, we’ve tracked our successes and will share some of those numbers with you here. The Wisconsin Union sponsored and supported more than 2,786 events this year, which included everything from skiing and snowboarding trips to theater performances. Last year, you found almost daily activities to help you learn, relax or simply have fun. 2,452 were created by the Wisconsin Hoofers, Outdoor UW and the Union’s programming and leadership board the Wisconsin Union Directorate. Most of these were student-led. So, learning took place not only among attendees but also behind the scenes among our more than 1,000 student leaders. The Union’s open arts studio Wheelhouse Studios also held 353 events. The topics about which customers learned at Wheelhouse are too many to list, but, to name some, included acting techniques, swordsmanship of Japan, relief printing, silk scarf-dying, brooch-making, Indian-style chicken and fish recipes, and digital photography. Plus, above Wheelhouse Studios, the Memorial Union’s 5th floor is home to the Willis L. Jones Leadership Center, which helped students hone their leadership skills in many ways, including through 19 workshops. No matter which experiences in which you chose to take part, we are so honored and glad that you joined us. Along the center of the Memorial Union on Langdon Street, you’ll find the words, “Erected and dedicated to the memory of the men and women of the University of Wisconsin who served in our country’s wars”. In the 1920s, the Memorial Union was designed, in part, to serve as a memorial to our university’s fallen service members, to remember all those who served and to honor their sacrifices. On the day it opened in 1928, Memorial Union was dedicated to these heroes. The building also has wooden plaques on its second floor with the names of some of those individuals. The Wisconsin Union has continued its commitment to honoring these heroes with the addition of an electronic kiosk on the building’s second floor and a website. These are collectively known as the Gold Star Honor Roll and serve as a permanent and continually updated memorial to alumni who passed away in active duty. The memorial debuted on Nov. 11, 2017, with the names and, when available, stories of more than 1,000 service members. By June 30, 2018, UWGoldStarHonorRoll.org was visited more than 19,000 times. It is our hope that these heroes’ stories are never forgotten and that they are remembered as individuals each with a unique story. Wheelhouse Studios’ annual Paintacular is nothing short of spectacular. This is a strong adjective, we know. But one that is so deserved. We’ll tell you why. First, it’s Madison’s largest paint night. 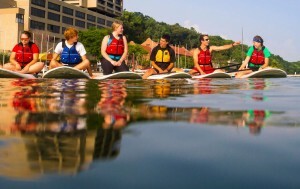 Second, this is an instructor-led event that (when weather allows) takes place right on the Memorial Union Terrace, a place many call the best place on Earth. Third, it’s totally free. The Wheelhouse team provides the paint, the canvas and the inspirational view at no cost to participants. 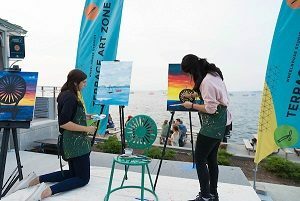 More than 800 Wisconsin Union members and guests participated in our September 2017 Paintacular, and we recently held another successful Paintacular that brought together UW-Madison students, staff and faculty and community members. Look for the next Paintacular in September 2019. Meanwhile, you are welcome to click here to check out all of the events at Wheelhouse, some of which, such as Free Art Fridays, are also free. The Wisconsin Union Theater spaces in Memorial Union, called Shannon Hall and the Play Circle, hosted 228 events. Let’s take a deeper dive into that number. Seventy-nine different organizations produced events in these spaces, including 45 hosted by UW-Madison registered student organizations and 53 hosted by academic departments. This was in addition to the many performances planned and hosted by the Theater team and the Wisconsin Union Directorate. For example, the Wisconsin Union Theater welcomed Inti-Illimani this past season. Inti-Illimani is the iconic face of the Chilean Nueva Canción movement, which celebrated a renewal of Latin American folk and traditional music. Having produced more than 40 albums, the group is celebrating 50 years of exploring the topics of human rights, imperialism, democracy, and the Latin American identity through traditional Chilean folk music with an edgy twist. They shared their music and messages with hundreds of audience members at Shannon Hall in October 2017. In total, attendance for all Theater events exceeded 92,000. The Wisconsin Union Theater is continuing its tradition of being a center for cultural activity with a new theater season. More information can be found here. Wisconsin Union members enjoy an exclusive appreciation event called “Hearts and Drafts”. Our final number that we’ll share with you is the number of individuals who joined the Union family as Wisconsin Union members: 2,156. That’s 2,156 who have joined us in a commitment to continuing our more than 110-year legacy of leadership, learning and fun. They have chosen to be part of a more than 120,000-person membership community that enjoys plenty of benefits, such as discounts on hotel stays at Union South and Memorial Union, free meeting room rentals for personal special events, and more. And we hope that these benefits make a difference in their lives, just as their contributions make a difference to all of us here at the Wisconsin Union. You see, without these members and their dining purchases, membership, and donations, we would not be able to do what we do. We would not be able to provide our programs, events, facilities and student leadership opportunities. It’s possible because of our members, including UW-Madison students and those who join as community members. More information about Union membership benefits is available here. These measures of success are important. But, perhaps more important are those things that can never be measured. The minds that were expanded. The new perspectives that were gained. The smiles and laughter that echoed throughout our buildings. The thoughtful conversations that took place among strangers that became friends. The life that was lived within our walls and in our outdoor spaces. These are the things you will not find in an annual report but are as real as any metric by which we could assess our impact. From thousands of grateful team members and student leaders here at the Wisconsin Union, thank you helping make this year of incredible impact possible. To learn more about the Wisconsin Union, you are welcome to visit union.wisc.edu.